However, the success of your BigCommerce Google Shopping integration campaign depends upon how planned and careful you’ve been while setting thing up. Products on your BigCommerce store have the key role to play. After all, those are the listings that will be copied to the Google Shopping. 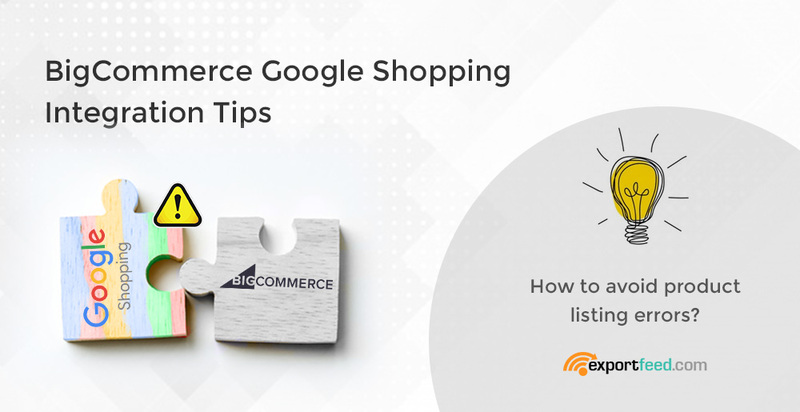 Your impeccable observation is required when you list your products on BigCommerce store if you are planning to launch a Google Shopping campaign. One common mistake that most online retailers make when adding products to their store is to leave out the product attributes that they don’t know. And that is okay till you are only selling through your store but when you need to connect to a bigger selling platform, you need to work on it again. So, let’s check the mandatory attributes you need to launch an effective BigCommerce Google Shopping campaign. This is the product.SKU of your BigCommerce store. If you have added product variations, you need to have different SKU values for those variations also. You may have added longer values to for easy identification but while connecting with Google Shopping, please remember that you need to keep your ID within 50 words. Make sure that you enter SKU value on your BigCommerce products. This is the title of your product as displayed in your BigCommerce store. Certainly you need to send this value to the Google Merchant Center as well. Though you can include promotional words in product title for your store, you need to avoid them for Google shopping. Along with that, you also need to keep your product title within 150 characters. Make sure that you don’t use promotional words or cross character limit. The description of your products will provide added information to help your potential customers make the buying decision. Alike the title, you are not allowed to list products with promotional texts. Another keen observation is required at the point where you use paragraphs and lists on your product description – anything over 5000 characters is not acceptable and will be disregarded. Product link is another information that you send to Google Merchant center. You can only use the product link for website which you have verified on your Google Merchant center. Though you can append the tracking links on the product link URL like UTM tracking, you should not use send the product URL for pages where you will include multiple redirects. If you have optimized your website, you can also include the mobile link attribute in your product feed but this is optional. Without the image link for your individual product on the product feed, Google Merchant feed will display errors. Note that the image link should be accessible for public. However, there are certain rules for the images that Google Shopping will display. The image format should be GIF, JPEG, BMP, PNG or TIFF and the individual file size should not be over 64mb. If you are selling products under paint category, you can use images with single color. You need to provide these information to Google Merchant Center to help uniquely identify your products. If you are unaware about the GTIN, please get the information from here. MPN is the Manufacturer Part Number provided by your product manufacturer. If you are selling non-branded products you can set Brand as your Store name when using ExportFeed services. These are the common attributes rules which apply for any of your BigCommerce products when mapping them with the Google category. However there are more Google category specific rules. If you get product listing errors while listing your products on Google Merchant center, you take help of our support team for a quick resolution or check the product feed specification details here. Haven’t started using our BigCommerce App for Google Shopping campaign? Here are a few benefits of using ExportFeed app on your BigCommerce store.